Tendering and procurement for this project was handled by the end clients' Project Engineer. The tendering process called for Hoist & Winch Ltd to assist the Project Engineer in selecting the correct equipment in terms of dimensional criteria and again various operational characteristics required to satisfy the application. This was followed by a staged hoist installation programme over a very intense 4 week period which also included load testing of hoist runway beams installed by the steelwork contractor employed on the new build project. To facilitate hoist installation, Hoist & Winch Ltd worked from 8m working platforms level MEWP’s (Scissor Lifts ) and from mobile scaffold towers. The hoist unit runway beams and support steelwork design was an unusual design which used tubular steel section in places and featured 2.2 metre long cantilevers at both ends of each hoist runway beam. 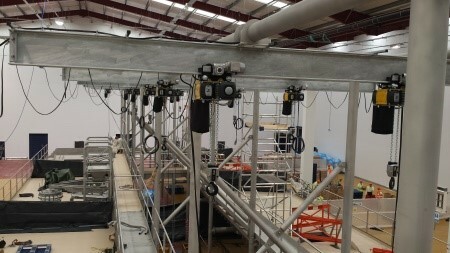 Some of the hoist runway beams had 2- off electric hoist units installed on each beam with electrical power supply for each electric hoist being fed from the opposite ends of the hoist runway beam. The unusual runway beam and support steelwork design called for a detailed load testing plan to be devised and implemented. During the load testing of the hoist runway beams and support steelwork, it was noted that in some cases the deflection measurements obtained and flexing witnessed was excessive and in this case, Hoist & Winch Ltd were called upon to advise both the end client and the steelwork contractor on their findings and recommendations, with reference to BS 2853 - 2011. These discussions were handled very professionally by all parties concerned and after joint review, a course of additional longitudinal support structure and runway beam cantilever bracing was agreed with and implemented by the steelwork contractor. The resulting follow up load testing was successful and Hoist & Winch Ltd were then able to issue LOLER Thorough Examination Reports for the completed electric chain hoist and runway beam installation work. All site installation work was again subject to very stringent planning requirements, which required very carefully documented Risk Assessments and Method Statements, which were reviewed and agreed by the Project Engineer and the Safety Department before any work could commence. This site work was also subject to CDM Regulations and site safety policy required all site engineers to hold a valid CCNSG Passport to Safety.